We also have vacation rentals and long term rentals on Oahu. This is the closest building to the ocean in all of Hawaii. This building boasts the best views in all of Maui. It is less than 2 miles from Lahaina the famous Whaling village. The bathroom is newly remodeled with Brazilian granite countertops, Asian Mohogony cabnetry, floor to ceiling Italian tiling, hansgrohe fixtures, and a hardwood ceiling and features dramatic view of the West Maui mountains. Come see the whales, up close and personal, from your private lanai. Enjoy the lapping of the waves in luxury and comfort at our lowest prices ever Drench your senses in our modern and newly remodeled deluxe oceanfront corner condo. 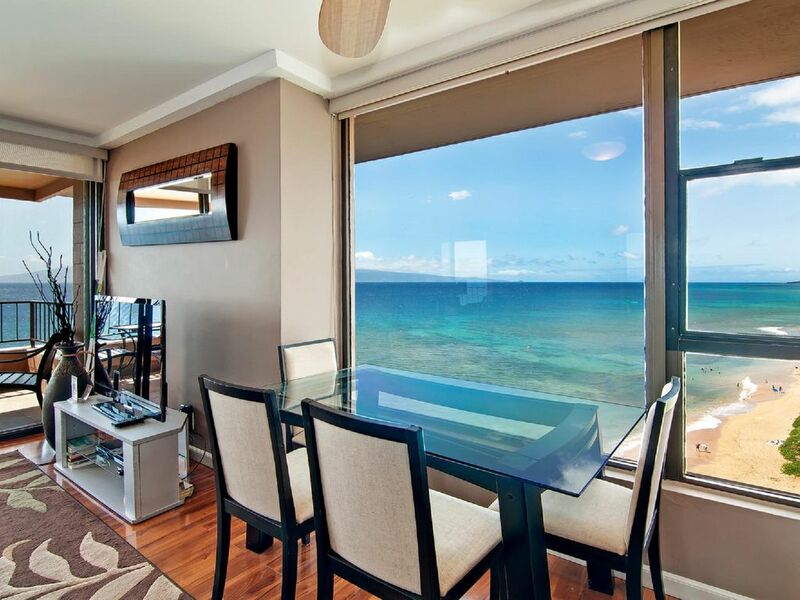 Be our guests in this unique and spacious penthouse corner unit, Maui Kai 1008. You will not believe how close you are to the ocean in this private and quiet location. You will feel as if you are the only ones in paradise- perched atop the ocean waves, drinking wine in huge 180 degree ocean views from your kitchen, living room, and your spacious and comfy lanai...Enjoy a romantic meal on the Mango wood furniture set from Bali or spend an unforgettable evening gazing at a sunset that has no rival. I lived in the Lahaina area from 2003- 2016 until I moved to Oahu. This was my first time back to Maui and came with my fiance who wanted me to show her all the places and introduce her to all the people I've been ranting about for over 2 years now. The Maui Kai is perfectly situated near everything we wanted to do. The suite was awesome. Dora especially enjoyed leaving the sliding doors open at night to let the sound of the crashing waves lull us to sleep. It rained pretty hard on Tuesday and some water came through the side window but it did not deter us at all from our stay. Unit is as advertised with fabulous views. Able to watch whales from the balcony, and from the dining table. Also saw seal waddle up onto beach and sun for a day. Convenient to grocery store, and to restaurants. The pros- This condo has a beautiful view and kitchen appliances for all your cooking desires. Deck furniture is comfy for watching whales, dolphins, monk seals and turtles, which we did get to see them all. The couch is comfortable for sitting. The building is in a good location for walking to the grocery store, eating out and getting to the beach walk. The pool area is nice and well maintained. We watched some of the luau next door from the bedroom window. The cons-the ac does cool, but I spent 2 weeks of sleepless nights due to the noise of the ac which sounded like someone slamming a cabinet door every time it cycled off. This has been reviewed before and hasn’t been repaired. The bed rattles when there is any movement. I stuffed a towel behind the headboard to fix most of the noise. The rest of the squeaks and squawks are due to the type of foundation it has or a missing bed slat. (There was one in the closet) We had an electrical problem while there (GFI circuits kept tripping) which required the owners maintenance personnel to be there for 2 hours. They didn’t fix the problem and came back for another 2 hours. Maintenance man decided that it was due to a malfunctioning toaster and the toaster was replaced. Problem fixed. The closet door in the bedroom doesn’t slide. The top drawer in the bathroom is broken and has been written about in a previous review, still not repaired. It falls off its track when opened. There was a scum on the refrigerator that when I saw it, I thought there was something wrong with the finish on it. After several days of looking at it, I decided to try the sponge and it cleaned it off. It was just dirty. The bathroom floor needs a good scrubbing. I shouldn’t have to notify anyone to come clean after we arrive. It should be clean when we get there. Once upon a time this condo was probably a very nice condo, but now it needs some TLC to live up to the owners description. As of today, 15 days after checkout, our damage deposit has not been refunded and owner has not responded to my inquiry. My husband really enjoyed our 8 day stay in this unit. It was super clean and came with all the kitchen gear, dish soap,dishwasher liquids, trash bags. The bathroom had plenty of toiletries and bath towels, in the closet in the bedroom there were 3 towels for the beach as well. From other travelers theres even spices in the cabinet and unused travel shampoo/conditioners if you run out of the ones the condo owner provides! Theres also a hall closet of tons of gear for the beach. The view is incredible and never got old, the sunsets when it wasn't cloudy were amazing from the patio or the beach just steps away, the beach next to the condos was never too busy and the water was beautiful. Location is GREAT, we found ourselves on front street everyday and it was incredibly easy to get to everything, even to the north shore from here. Parking was always available, check in and check out was effortless and everyone we ran into while walking around the condo complex was incredibly friendly. The cleaning crew arrived and we were just finishing up getting our stuff ready and they were very nice and let us take a few extra minutes before they came in. Overall we had an incredible experience and would never hesitate to book this property again. Great views! As presented, but not perfect. This property was exactly as presented in the listing. The views are fantastic! The building itself is somewhat dated, and certainly not fancy, but this unit has been nicely redone. The kitchen is great, furniture comfortable. The only reason we didn’t give it five stars is the AC system which appears to date from the Johnson or Nixon Administration. It is located in the ceiling of the bathroom and even when not stressed, drips on you in the bathroom. Only other criticism would be that the bedroom linens were clean but thin and tired. If the AC were updated, and new linens provided, this would be a total 10 out of 10. We couldn’t have been happier with our choice. This ocean front location may be the best on Maui. The decor is modern and very comfortably done. Centrally located for activities and dining. We highly recommend this property and would definitely rebook another stay without hesitation. This deluxe oceanfront corner condo boasts fantastic ocean views from every angle; the living room and kitchen have a large side picture window and huge glass sliding doors opening up to the expansive ocean horizon and gorgeous islands of Molokai and Lana'i. To add to the ocean beauty, we have installed floor to ceiling mirrors on the living room walls for reflected ocean views everywhere you look! luscious mountains behind you at the same time, West Maui mountain views to be had from the bedroom and bathroom. Watch whales jump and teach their young during season (Dec-April) from your private balcony. Enjoy a sparkling coral reef year round from the mango wood outside furniture set. And all year long, be thrilled with the frequent visits of the Hawaiian Green sea turtles, considered sacred by the Native Hawaiians. If you are really lucky, you may spot the many pods of local spinner dolphins and the occasional monk sea frolicking in these protected waters of West Maui.